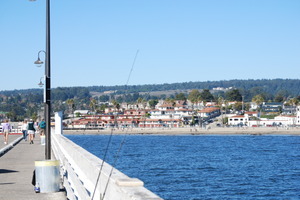 I’m back from the Monterey Peninsula and Santa Cruz, areas known for clean air. Look at that Santa Cruz skyline! According to the American Lung Association's 2007 State of the Air Report, this area receives an A for ozone pollution and an A for particulate matter pollution, meaning virtually little to no air pollution. One of the few clean air areas left in California. Though here, clean air rarely comes cheap. Beyond pristine Nature lay million dollar and up homes. 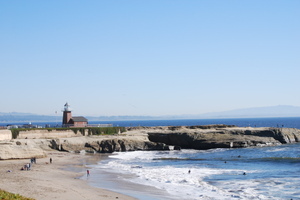 The area has gorgeous big green leaf trees, a pristine skyline as you see in above lighthouse photo, a famous boardwalk with rollercoaster, popular surfer spots, and UC Santa Cruz, which sits atop a hill overlooking the Pacific. UCSC has a dynamite theatre program. My mom, uncle, and her friend Barkley went to see The Princess and The Pea at UCSC, which I highly recommend for its costumes, humor, acting, singing, and that make-you-feel-good feeling. Santa Cruz is ultra-liberal and generous with homeless, which means, homeless wander around an eclectic downtown. Santa Cruz retains a 1960s hippie, purple pink hair, body piercings and art, new music, and open-mindedness vibe that mixes with natural beauty. 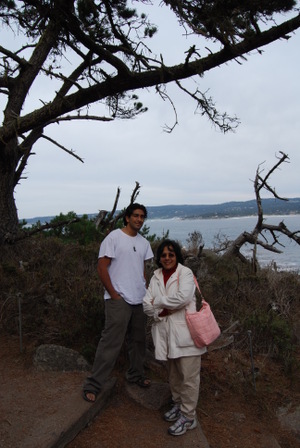 Next I went to Pebble Beach where my friend Tom stayed at his soft-spoken mom’s house, beautifully located on the famous 17-mile drive, and they invited me to stay in their guest room for a night. They live on a road which winds through a Cypress grove, grand mansions, hotels, and along a wind-swept ocean front. Tom took me sightseeing in Pebble Beach and Carmel. Here I am near The Lone Cypress, a famous landmark. 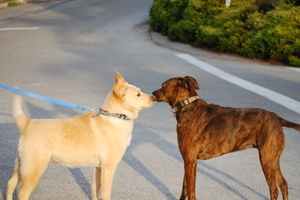 And here's dogs "kissing" enroute to Carmel's white-sand beach. Massive waves greeted us yesterday on the 17-mile drive, which gave me a natural energy high like I don’t recall getting in any other way. Crashing waves against gravel, rock, and sand, beads of salt-water bouncing in the air, birds flying and diving, and singing their song. 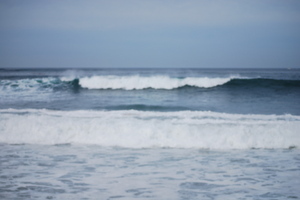 Energetic waves lifted me higher and higher. I was planning to leave the area but the ocean made me feel so good I decided to go to Point Lobos State Reserve, a living museum where land and surf converge. 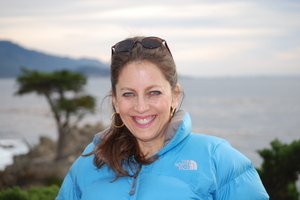 I took a trail leading to an old whaling station, walking on a bluff above crashing waves, rocks, and water, an evergreen blue shade, with divers emerging in black wet suits. At one point, no other people were on trail. Lions and tigers and bears, spiders, oh my! Where was I walking alone inches away from a cliff I wondered? I prefer to walk with a friend but alas... Oh good, I made a few friends on the way. Here's a nice mom taking a walk with her son. He's only 24 and already has a Master's in Public Health and may soon get a PhD and help disadvantaged overseas. His mom is proud, and enjoys his company. I drove back to Monterey, stopping for lunch near the Cannery, and hit the road at 2:00 p.m., making it back to Los Angeles at 7:30 p.m. I thought I’d hit a lot of Sunday Thanksgiving traffic, but fortunately there was none. The Malibu fire was contained, and unlike last month, there weren’t several fires burning out of control. California is beautiful. Rolling brown hills, wind swept trees, horses, cows, farms, quaint towns along the ocean. 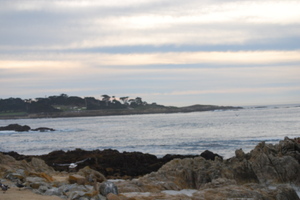 I enjoyed being alone with my thoughts, which now includes a love for the Monterey Peninsula. Tomorrow, I'll share photos and my wonderful experiences in Monterey.